The HTC One Mini has been seen here and there, showing itself around the web, teasing us with its small yet elegant looking body. 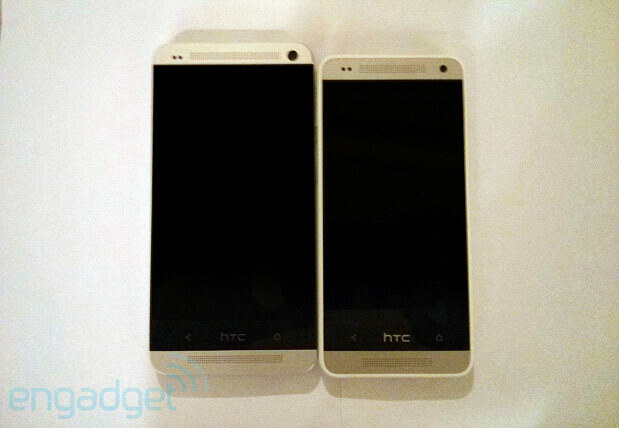 Above, the One Mini is pictured (albeit extra grainy) next its bigger brother, the One. Along with this picture, many details of the device, which is set for launch sometime around Q3, have been confirmed. It does sport a HD 4.3″ display, Sense 5 (BlinkFeed), Android 4.2.2, UltraPixel camera, along with a 1.4GHz dual-core chipset. Reports out of Bloomberg this morning are pointing to an August release for the One Mini, a timeframe that should work out just fine given there are no delays. On top of that, we haven’t heard any news about which carriers would be carrying it, so don’t bother asking if it’s coming to Verizon. You know how they are about announcing devices. Has anyone been following this device and are actually interested in picking it up?